You'll be seeing a lot of gorgeous buns this weekend on the blogesphere. Each one with a story to tell. Buns of all sizes and shapes and I am sure each one will make you want to stick your teeth into them, lick them and luxuriously bite into them. No, my blog has not gone x-rated - it's just another awesome Daring Baker challenge, which had us all seeing buns in September. Cinnamon, sticky, spiced, fruity and nutty buns. Our hostess this month was magnificent Marce of the wonderful Pip In The City. Marce was able to select a winner of a challenge. Her aim was to provide us with a challenge that fitted well with the ever growing list of members. No easy task, considering our group has expanded to an incredible size with members in every corner of the world - literally. I can imagine how difficult it must be as a hostess to please everyone. However, when Marce revealed her challenge I think almost everyone in the group was elated by her choice. I certainly was. I love buns. Sticky, cinnamon rolls drizzled with caramel and topped with nuts and fruit. I am not sure how many of you are familiar with the delicious rolls from Cinnabon. They taste incredible and I cannot even begin to put their exquisite taste into words. I just can say one thing I am so glad that there is not a Cinnabon outlet here in Gemany otherwise I know it would be my downfall! In Dubai - it's a whole different story though. With Cinnabon outlets dotted all across the city, it becomes hard to avoid the wonderful fragrance of freshly baked cinnamon rolls wafting in the air. We did not have to use cinnamon, but could use any other spices or a mix. We could do both cinnamon and sticky buns or simply choose one. We did not have to use any nuts for the sticky buns if we did not want to. We could substitute the raisins for any other dried fruit. I decided to go for sticky cinnamon buns topped with walnuts and cranberries. I would have preferred to use pecans but in Weimar finding Pecans is not so easy. They are mostly available from October and are rather expensive. It's a classic combination and I love the tart flavor the cranberries gave the buns. The recipe provided by Marce was really easy to follow and I had absolutely no trouble with the dreaded yeast. For all those who enjoy a good sticky roll for breakfast I urge you to give these a try. You won't regret it. Cream together the sugar, salt, and shortening or butter on medium-high speed in an electric mixer with a paddle attachment (or use a large metal spoon and mixing bowl and do it by hand). Whip in the egg and lemon/lime extract/zest until smooth. Then add the flour, yeast, and milk. Mix on low speed (or stir by hand) until the dough forms a ball. Switch to the dough hook and increase the speed to medium, mixing for approximately 10 minutes (or knead by hand for 12 to 15 minutes), or until the dough is silky and supple, tacky but not sticky. You may have to add a little flour or water while mixing to achieve this texture. Lightly oil a large bowl and transfer the dough to the bowl, rolling it around to coat it with oil. Cover the bowl with plastic wrap. Mist the counter with spray oil and transfer the dough to the counter. Proceed as shown in the photo for shaping the buns. Transcription: (A) Roll out the dough with a rolling pin, lightly dusting the top with flour to keep it from sticking to the pin. Roll it into a rectangle about 2/3 inch thick and 14 inches wide by 12 inches long for larger buns, or 18 inches wide by 9 inches long for smaller buns. Don´t roll out the dough too thin, or the finished buns will be tough and chewy rather than soft and plump. (B)Sprinkle the cinnamon sugar over the surface of the dough and (C) roll the dough up into a cigar-shaped log, creating a cinnamon-sugar spiral as you roll. With the seam side down, cut the dough into 8 to 12 pieces each about 1 3/4 inches thick for larger buns, or 12 to 16 pieces each 1 1/4 inch thick for smaller buns. For cinnamon buns: line 1 or more sheet pans with baking parchment. Place the buns approximately 1/2 inch apart so that they are not touching but are close to one another. Proof at room temperature for 75 to 90 minutes, or until the pieces have grown into one another and have nearly doubled in size. You may also retard the shaped buns in the refrigerator for up to 2 days, pulling the pans out of the refrigerator 3 to 4 hours before baking to allow the dough to proof. Preheat the oven to 175 degrees C (350F) with the oven rack in the middle shelf for cinnamon buns but on the lowest shelf for sticky buns. 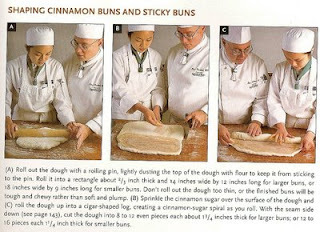 Bake the cinnamon buns for 20 to 30 minutes or the sticky buns 30 to 40 minutes, or until golden brown. If you are baking sticky buns, remember that they are really upside down (regular cinnamon buns are baked right side up), so the heat has to penetrate through the pan and into the glaze to caramelize it. The tops will become the bottoms, so they may appear dark and done, but the real key is whether the underside is fully baked. It takes practice to know just when to pull the buns out of the oven. Sift 520g (4 cups) of powdered sugar into a bowl. Add 1 teaspoon of lemon or orange extract and 6 tablespoons to 118 ml (1/2 cup) of warm milk, briskly whisking until all the sugar is dissolved. Add the milk slowly and only as much as is needed to make a thick, smooth paste. Caramel glaze is essentially some combination of sugar and fat, cooked until it caramelizes. The trick is catching it just when the sugar melts and lightly caramelizes to a golden amber. Then it will cool to a soft, creamy caramel. If you wait too long and the glaze turns dark brown, it will cool to a hard, crack-your-teeth consistency. 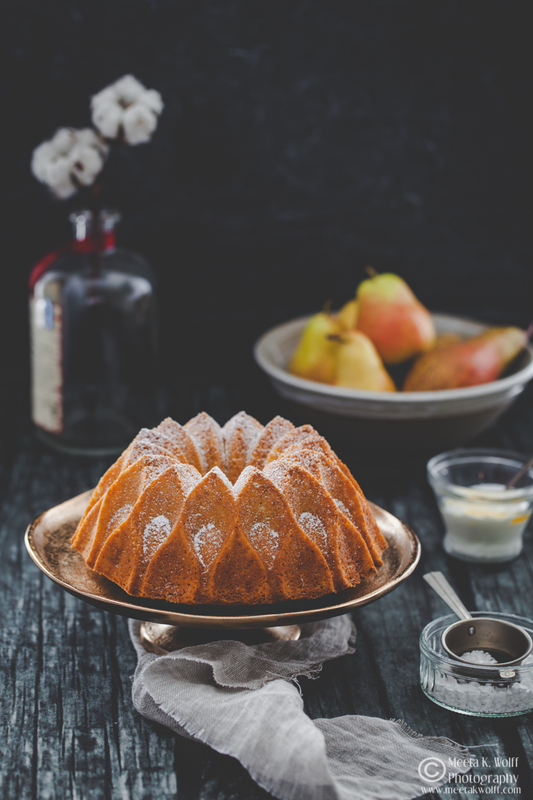 Most sticky bun glazes contain other ingredients to influence flavor and texture, such as corn syrup to keep the sugar from crystallizing and flavor extracts or oils, such as vanilla or lemon. This version makes the best sticky bun glaze. In the bowl of an electric mixer, combine 95g (1/2 cup) granulated sugar, 100g (1/2 cup) firmly packed brown sugar, 1/2 teaspoon salt, and 230g (1/2 pound) unsalted butter, at room temperature. Cream together for 2 minutes on high speed with the paddle attachment. Add 1/2 cup corn syrup and 1 teaspoon lemon, orange or vanilla extract. Continue to cream for about 5 minutes, or until light and fluffy. Use as much of this as you need to cover the bottom of the pan with a 1/4-inch layer. Refrigerate and save any excess for future use; it will keep for months in a sealed container. Making these buns was a real breeze and rather comforting. The steps were easy and the ingredients were not exotic or difficult to handle. I was amazed that something that looks like a lot of work is in actual fact so simple. The results were extraordinary. Soft, moist and sticky. The recipe yielded 12 buns and these were gone in a matter of a couple of days. As a matter of fact I found that the taste of the ingredients got better. Just one word of warning though - make these at your own risk. They taste too good and are far too difficult to resist. Especially with the aroma of lovely fruit, nuts and cinnamon lingering in the air. I thank Marce from the bottom of my heart for this one. Without you I think I would still be dreaming about Cinnabon rolls instead of making my own buns. 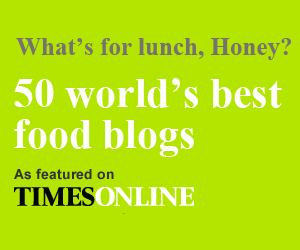 If you want to see more hot Daring Bakers' buns then click your way down the blogroll. Have fun drooling! I just made the cinnamon rolls and now I+m beginning to think I will have to try to make some sticky ones as well! Beautiful, Meeta! Mine are all gone. Do you have any left? I'll always take walnut over pecan. Wow, great looking buns my friend! I only made the cinnamon buns but everyone is convincing me I have to try the sticky buns. 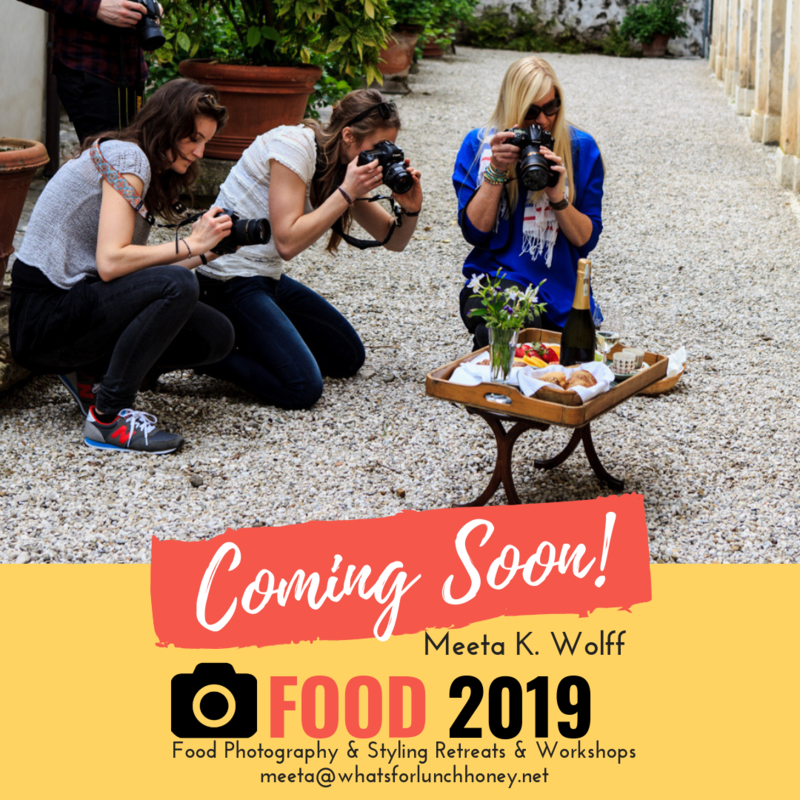 Your pictures are gorgeous, and if you want pecans, I can send you some, I brought back big packs of them from the US (where I'm headed again soon so it's no biggie). Very nice job on this, great photos! I never imagined that buns would be so much fun!!! And gorgeous. Wow, Meeta! Those are hot hot hot! Great job on your buns Meeta! They look lovely! I really wish I had an oven in light of this month's challenge. It sounds delicious and I'd love to give it a try. Why do you live so far away? Those buns are just so perfectly sticky! I felt comforted when I made them too and I even felt like supermom for a split second being able to serve them up to my little one for breakfast! 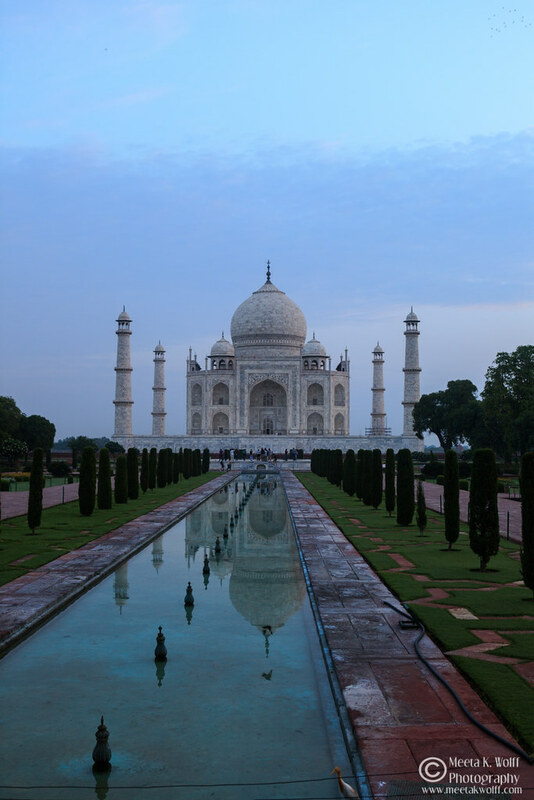 Your photos are beautiful, as always, Meeta. I really enjoyed this recipe as well, and will certainly make it again with some minor adjustments. I happen to have one more downstairs with my name on it for breakfast this morning! YUM! They look beautiful and I really like the idea of adding cranberries. I bet they helped to balance out the sweetness. Wow, these look absolutely lip-smacking. Oh, that's such a gorgeous photo! Great job! They look beautiful Meeta!! I love the fantastic photos! As always Meeta, the photos are simply stunning and make me want to dive right in! 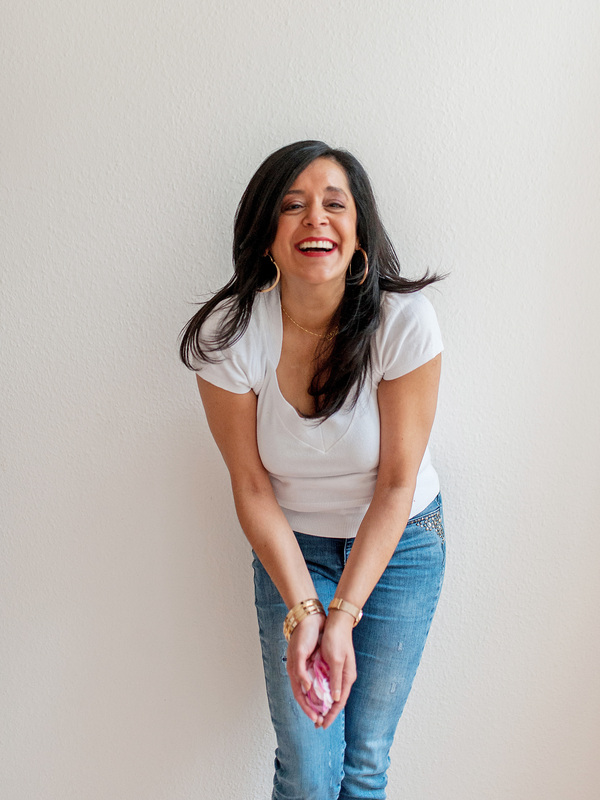 Great photos, Meeta! And I'm with you- I thought that making the cinnamon rolls sticky would be much more difficult than it was. A great recipe indeed! i will have to make the sticky buns, now that i have seen yours. YUM! 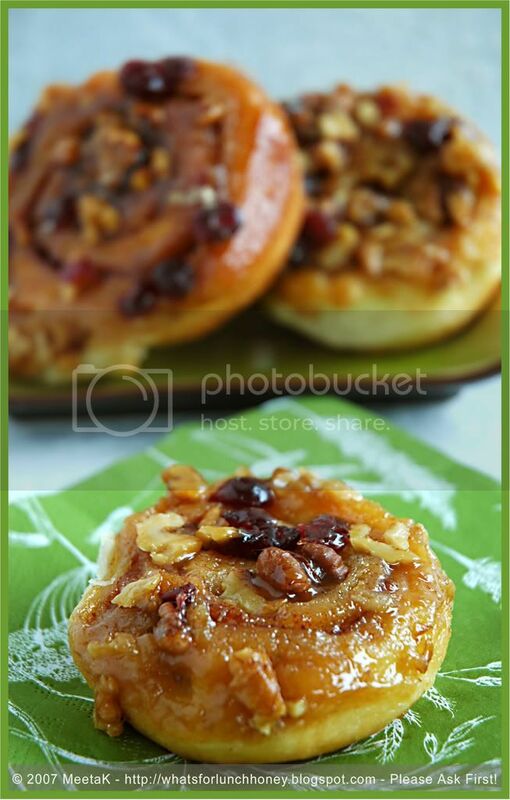 Great Pictures, your cinnamon buns looks absolutely delicious!! the book from which the transcription is taken is peter reinhart's the bread baker's apprentice, isn't it? it's one heck of a book. great looking buns, meeta. I love your super-stuffed sticky buns - it looks like they're covered in jewels! Wonderful job! whoa!! its raining buns!! and fabulous buns to get rained on with!! plus the pictures do abso justice to your creations as usual!! Wow! I mean, WOW! They look absolutely to die for. I can see why they didnt last. GREAT JOB! The picture is beautiful, it says it all. Yum, yum, yum Meeta! I love all those sticky buns toppings!! Boy.. these look too good. I think I will have to give in to my temptation and try these. Inspite of knowing how high in calories the Pecanbon is, I have an illogical weakness for it. I agree, these buns were a breeze. Your stikcy buns look gooey and fabulous. Meeta, I love your buns! They look absolutely wonderful! Meeta, gorgeous photos as usual. I love the contrast of the green and bun. Great job this month and glad to share the DBers with you each month!! What saves me from having Cinnabon too often is the cost - over $5 for 1 bun is alot of money and it adds up very quickly! Especially when you order it with extra icing. Yes, I am guilty of that. Wow - these look wonderful! I, like many, didn't try the sticky buns. I am thinking they're in my future. My mouth's watering as I stare at the pics. Well done! Dear Meeta, such lovely pictures! Like ilva, I only made the cinnamon rolls. Seeing your bunz has made me salivate for some sticky bunz! 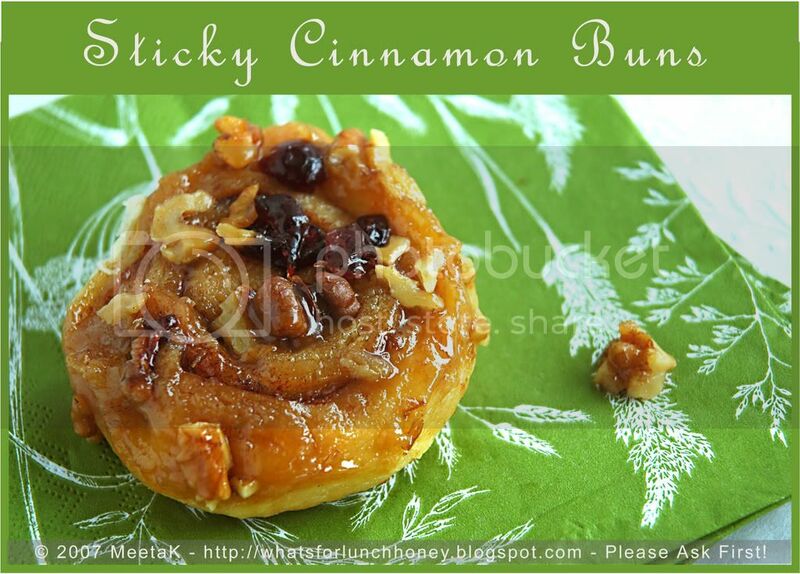 Meeta, those sticky buns look amazing. I'm gaining weight just looking at the photos! Oh they look so wonderfully sticky. Great Buns! You are right: make them at your own risk...just looking at them is evil..they are so good! Great shots as always! Ooohhh.. those buns look lovely!! Well done my friend! Oh WOW! Thanks everyone for all your comments. These were such a hit that I can already smell the aroma of these being baked all over the world again. Meeta, cinnabons here are far too sweet! I'm sure yours are far better :) Btw, any plans of coming down here? And I was planning to make them as I love the smell of cinnamon baking :-) And now I see your post. Tomorrow's a holiday and I know what I am going to be making!! Thanks a ton hon. hi meeta, great fan of u'r blog! can't take eyes off of your beautiful photography...also, luv u'r bollywood cooking. from one bollywood fan to another "great going, girl, luv u"
its amazing how you make it all seem so simple. this process by no means seems simple to me. then again, omelettes are what i classify as simple, so i guess... :D you are right in a way! Looking fantastic as always! Oh to be your neighbor, they must be some lucky folks! Those buns look amazing!Its breakfast time here and I'm drooling over your buns.. Have to try making this now!! Your photos really are making me drool!! I love that they each kept their circle shape. They look amazing! Oh Meeta Meeta, they are to die for, such great buns! Thanks for the Cinnabons link too, we don't get them here, but they look lovely! Oh such nice piccies! Never got it right on mine..
Made lemony cinnamon breadpudding tonight; so good! If you'll excuse me: burp! They look great Meeta. I am definitely being inspired to try the sticky buns again with some kind of fruit. Yum! They look superb! You're the 2nd person to tell me about Cinnabon, we don't have them out here in Australia. Maybe thats a good thing, cos these are my fav too! Oh yes, these are so dangerous to have around. 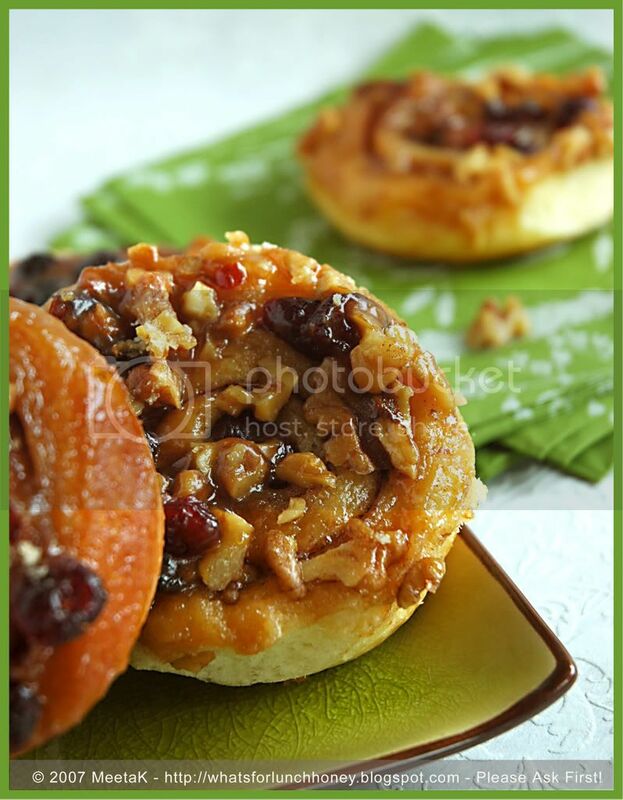 Really beautiful sticky buns Meeta! oh meeta, they look divine! Thanks everyone for such lovely feedback. Hilda Please excuse me for not addressing your generous offer in my prior comment. Thanks so much - you are a real sweetheart and if you like yes I would love some of those Pecans!! Oh, those buns are beautiful! I only wish I could take as pretty pictures as you. Meeta, Thanks for the warning...I may just skip making these at all because if they are so easy and good I may just have to make them all the time (and I dislike going to the gym :)Your photos are wonderful as usual, especially the first one. I think your sticky buns look divine and I would gladly eat one for breakfast! Your photos are beautiful, and the buns look especially pretty with the cranberries on them! Thanks for warning me that I can't even leave the country to escape from Cinnabon! Nine days to make my way through a bevy of daring baker buns... and I've obviously saved some of the best for last. Beautiful buns Meeta! Great job on the buns Meeta. I always admire all of the Daring Bakers from afar! !